Lemon is powerful antioxidant and it reduces dark spots. Cut the lemon and squeeze the juice from it. Dip a cotton ball into lemon juice. You can directly apply lemon on it. Clean the elbows and knees with warm wet wash cloth. Now apply moisturizer to elbows and knees. Repeat this process to get results. Lemon is believed to be a wonder fruit which is the cure for a hundred ailments. Blessed with myriad properties and high sources of vitamin C, this tiny citrus fruit is today the key to most beauty solutions. Read on to know more about the benefits of lemon. Instead of your morning cuppa of coffee, squeeze in some lime juice into a glass of warm water and top it with honey. Now do a bottoms up and you are on your way to good health. Keep those zits away by repeating the drink daily and for that healthy glow. 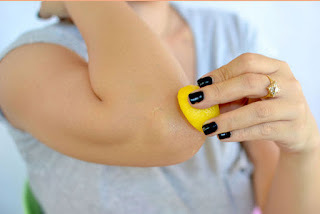 For those of you with oily skin, nothing works like the good old lemon. Get that greasy look off your face by just rubbing the wonder fruit on the face and neck area. Lemon can also be used as a hair conditioner; rubbing a few drops of the juice on your hair can also help in getting rid of dandruff. Combine it with henna for that lovely shine. Apply lemon juice with milk or cream before your daily bath. Leave it for 15 minutes, wash it off and get a good dose of beauty sleep to wake up to a fresh glowing day. Lemon when combined with other vegetables and fruits has a potent effect on the skin. For a younger looking and fairer skin, just combine lime juice with cucumber juice and sprinkle some turmeric powder. Leave it for half an hour before washing it off. At night before going to bed, add some lime juice and glycerin to a glass of boiled milk. Spread it all over your face and catch up on your beauty sleep!